A great end to a great year. The Flames came out on top as PROVINCAL CHAMPS for 2012/2013. 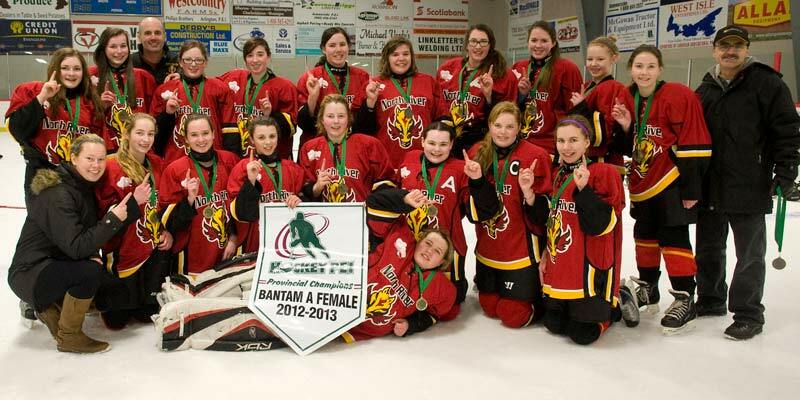 In a hard fought playoff series the Flames met the East Prince Wildcats in the finals. Carrie scored the lone goal of the game early in the first period and the girls played hard to defend thier lead and had a couple of goal posts and near misses durinf the game. Erica played fantastic in goal to earn the shutout. It was an all out effort from every player in every game that earned the team thier championship banner. The Flames had a 28 - 8 - 5 season overall and outscored thier opponents nearly 2 to 1. Our coaches had the girls well prepared and motivated all season and our parents made sure they made it to the rink. Thanks to Kierston, Kevin, Leonard, and Lowell for thier time and effort over the season as well as to all the parents who pitched in during the year. Loss and a Win this week. The Flames started the week with a loss against East Prince in Borden 2 - 0. The flames were tired from their efforts over the weekend and East Prince took advantage of this and worked hard for their win on Tuesday night. The girls tried but just couldn't get it going. Friday night in Pownal saw the Flames rested and on their game for a 3 - 1 win. Dianna, Taylor and Maura contributed goals for the win while Erica was solid in the net. Only a last minute goal by Pownal kept the Flames from getting a shutout. The team sees Tyne Valley tomorrow night and then two more games against Pownal Sunday and Monday. 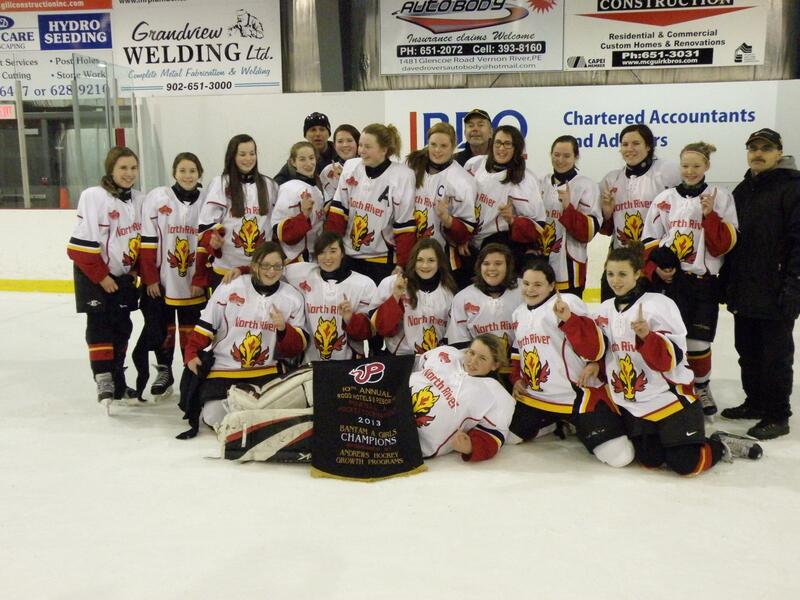 In an exciting game the Flames came out on top to win the Pownal Tournement Championship. It all started this morning with a 3 - 0 win over East Prince in the crossovers to get to the final this afternoon. Cara scored the Flames' first goal early in the opening period and for the rest of the first it was a back and forth hard fought game. Pownal tied the game late in the second period and followed one minute later with another goal to take the lead. The Flames were a little rattled and played hard and tried to battle back. With six minutes left in the game Emma M. won a fight for the puck and got a breakaway and put the puck top shelf to tie the game. The flames were back in the game and they played to win with big efforts from everyone. Pownal took a late penalty and the girls pulled out all the stops and in a bit of a scramble in front of the net Lacey pounded home the winning goal. During the game Erica made a number of good saves to keep them in the game. A big effort was made by the girls during the whole tournament and it payed off. CONGRATULATIONS GIRLS. Two early goals by Capital District set the tone for this early morning game in Belfast. It was a game of catchup for the most part. The Flames had plenty of chances in the early goling but some bad luck and solid goaltending kept them off the score board. Olivia scored two goals to tie the game with assists comming from Emma M, Maura and Laura. The Flames play again tomorrow morning and with a win in that game could advance to the final in the afternoon. In thier first game of the tournenment the Flames earned a 3 - 0 shutout over Tyne Valley. The girls had a goal in each period from Olivia, Brianna, and Laura. Assists were awarded to Niko, Emma M and Taylor. In a slow paced game the Flames controlled the puck most of the time and tested the opposing goalie a few times in scrambles and a couple of break aways. Erica didn't see alot of action but made a couple of nice saves to earn her 9TH Shutout of the year. The Flames play Capital district in their next game. The Flames managed a 1 - 1 tie with Northumberland on Thursday evening. Northumberland scored first with a goal in the first period and Dianna tied the game in the second. The Flames had ten minutes in penalties which hampered their offensive game. The Flames got their third win a row in game against East Prince tonite. Lacey, Cara, and Laura provided the goals. The game was played mostly in the opposition end with their goals coming on a break and a scramble in front of the Flames net. The game featured lots of good passes by the girls and some good thinking on the ice which allowed them to control much of the game. They were aggressive and put a lot of pressure on the East Prince team. All in all a good effort by the Flames. A solid game from everyone resulted in a 3 - 1 win for the Flames. The flames were dominating in this game with many shots on goal and lots of scoring chances. Dianna, Niko and Emma M. Got the goals with assists coming from Dianna, Taylor, and Joelle. Erica was tested a couple of times a made sure that the puck stayed out of the net. Let's hope this is the start of another streak for big week of hockey. Sunday in Montaque, Wednesday in Crapaud, Thursday in Murray River, Saturday in Charlettotown. GO FLAMES! The Flames dropped their third game of the year to a motivated Alberton team. A strong first period by the Flames was followed by slower second and third periods. A chippy game was reflected in ten minutes in penalties for both sides most of which were for body contact. The lone goal for Alberton was a deflection while the Alberton goalie made a couple of nice glove saves to record a shutout against the Flames. In a rare Saturday morning game the flames dominated the Tignish team allowing only six shots on goal while peppering the opposing net with shots. The Flames spent most of the game in the Tignish end of the ice with goals coming in each period from Jaylene, Brianna, and Olivia. Assists were provided by Dianna and Lacey. The defence did a good job of keeping the puck in the opposing end and denying Tignish any breakaways or good chances. Let's keep the good play up for our game in Alberton tomorrow. Tyne Valley continues to be a thorn in the side of the Flames. In a closely fought game the Flames dropped their second game of the season 2 - 1 to Tyne Valley. Lacey scored the lone Flames goal on a rebound in the second period. Erica played a good game with both goals against her being a bit unlucky. The first goal against in particular was unlucky because she had it in her trapper only to have it trickle out at the last minute. It was a game that could have gone either way with a lot of close calls for the Flames. There were a few times when the puck was just a couple of inches from going in the net; credit has to be given to the Tyne Valley goalie as she made more than a few good saves and was definitely star of the game in my opinion. In another strong game the girls came through with a 2 - 1 win over Alberton. Laura scored the first goal with a shot from the top of the circle that went in the 5 hole. The second goal came with a tip in by Brianna. It was a penalty filled third period which made for some excitement late in the game. Alberton pulled their goalie in the final minute of the game but failed to tie the game. Erica continued with her solid play and made some key saves. It's a second tie in a row for the Flames. Even though the girls dominated East Prince they could not put the winning goal past the opposing goalie. A break away in the first period gave East Prince their lone goal while the Flames had chances but could not get a lucky bounce. In the third Dianna scored on a hard driving run to tie the game. Erica was solid in net and made a couple of good saves to keep the flames in the game. Happy New Year to everyone. Please note that some player's stats are not 100% accurate. Due to some early inputting issues on my part some stats were erased. Avery for example is missing 6 games of stats of which I am sure she has at least 1 goal. I anyone else has a missing stat please let me know and I will try to correct the mistake. STREAK EXTENDED TO 5 GAMES!!!! The Flames extended thier winning streak to 5 games today in Tignish with a 2 - 1 victory. Lacey and Maura scored two quick goals early in the second period. Assists were provided by Jaylene and Joelle. Erica was busier than normal in goal this game and was only scored upon when the Tignish team pulled thier goalie late in the third. The Flames face Capital District tomorrow evening at the APM at 6:10; LET'S MAKE IT SIX IN A ROW. 4 IN A ROW !!! In a dominant game the Bantom A Flames defeated Charlottetown/Pownal 4 - 0. It was the third shutout in a row for Erica. A three goal first period set the tone for the game and strong defencive play shut down the opposition offence. Goals were provided by Brianna, Lacey, Jaylene, and Dianna. Assists from Joelle, Jaylene, Emma V., Kimberly, and Cara were appreciated. Next stop is Tignish on Saturday. THREE IN A ROW !!!! In another strong game the Bantom Girls came out on top with a 4 - 0 win over Pownal. Maura had a 2 point game with a pair of assists and Jaylene provided 2 points with a goal and an assast. The rest of the scoreing was supplied by Olivia, Brianna, and Lacey. Cara, Joelle, and Taylor also provided assists. Erica shone with her FOURTH shutout of the year. Will the Flames make it four in a row? Come out to the APM at 6:10 on Sunday to find out. IS THIS THE BEGINNING OF ANOTHER STREAK? The team came home with a 3 - 0 win over Alberton. In a penalty filled match Dianna, Carrie, and Olivia all scored for the win and Erica recorded her 3rd shutout of the year. WATCH OUT POWNAL! A two goal game by Lacey led the team to a 3 - 2 victory over Northumberland. Dianna added to the effort with a goal and assists were awarded to Cara and Maura. Erica did a good job of keeping the game close. It was a very exciting game with our final two goals coming in the closeing minutes of the game. Northumberland had managed to jam the puck past Erica in a scramble in front of the net to make it 2 - 1 Northumberland. Just off the next face off Dianna streaked down the left wing and put one past the Nortumderland goalie to tie the game. For the next 60 seconds the girls had a couple of chances to win it but couldn' t get it done. There was a line change with less than a minute left and Cara passed the puck to Lacey who took off and put the winner top shelf with only seconds on the clock. Hard work by all the girls for the whole game payed off in the end. In a close game the girls suffered thier first loss of the year. Tyne valley came out in front 2 - 1. Erica played a solid game and Dianna posted the teams only goal. Game in Tyne Valley at 4:00. Please have the girls there for 3:30. Carrie Larter's Mom is scheduled for dressingroom moniter. Good Luck. Saturday at 9:00 in Rutico. Please be ready to go on the ice at 8:55. Tuesday Nov. 27 9:00 vs Northumberland at APM. The Thompson's are schedules for 50/50 and the MacPhail's are scheduled for dressing room moniter. In a close game against Northumberland the girls came out with a 1 - 1 draw. Taylor got the lone goal and Erica made a couple of key saves. The girls had lots of chances but no lucky bounces came thier way this week. Still the Bantom A Flames remain undefeated. Keep up the good work girls. It's a 4 Game Streak!!!! In a great game against Tignish the North River Bantom Girls won thier forth game in a row 6 - 0. A two goal effort from Brianna and singles from Dianna, Kellyn, Taylor and Emma M. was enough to defeat a determined Tignish team. Erica came though with a couple of key saves for the shutout. The team played well and passed the puck and back checked for the entire game. The Nov. 18 game against Alberton has bee canceled instead we will be playing Northumberland on Nov. 18 at the APM at our regular time. This replaces the Dec 30Th Game against Northumberland. The girls remain undefeated with a win over East Prince Wildcats at Credit Union Place. The Flames held off a late charging Wildcat team for a 4 - 3 victory. Again it was a good effort by all. Two wins in a row!!! In another great effort the girls won thier first away game of the year against Charlottetown at the Cari Complex. Lacey and Olivia got a goal each and Erica was solid in net. The team had many chances and the score could have been higher if not for the good game by the Charlottetown goalie. Lets go for three in a row in Summerside tomorrow night. Please remember to take your medical forms to the game on Satuday if you have not already done so. Also The $50.00 per player can be passed in. As discussed at our meeting on Sunday each player's family will be responsible for the 50/50 twice during the year. We are scheduleing it by player number from highest to lowest. The Barnas did it this week and the Coadys are next then the Stevensons and so on. A float and tickets will be supplied. The girls got off to a great start to the season with a 2 - 0 win over East Prince On Sunday. Dianna and Laura each scored in a great effort by all players. Erica got the shutout. Way to go Flames.